Long winter nights allow observation of stars from all the seasons except summer, including two unusual 'morning stars,' Mars and Saturn. The First Quarter Moon rises around 1 p.m. local time, and sets around 1 a.m. The full Moon of December is usually called the Oak Moon. In Algonquian it is called Cold Moon. Other names are Frost Moon, Winter Moon, Long Night’s Moon, and Moon Before Yule. In Hindi it is known as Margashirsha Poornima. Its Sinhala (Buddhist) name is Unduvap Poya. The Full Moon rises around sunset and sets around sunrise, the only night in the month when the moon is in the sky all night long. The rest of the month, the moon spends at least some time in the daytime sky. The Last or Third Quarter Moon rises around 11 p.m. and sets around noon. It is most easily seen just after sunrise in the southern sky. A total lunar eclipse will occur at dawn on Saturday, Dec. 10, 2011. The graphic shows how it will look just before dawn in central California, surrounded by first magnitude stars. It will be winter solstice in the northern hemisphere, and summer solstice in the southern hemisphere. On this day, the sun is at its farthest southern declination, and is 6.5 degrees away from the center of the Milky Way. This is exactly the same alignment as will occur on Dec. 21 2012, yet no catastrophes have been predicted for this year, just as none will occur next year. Because of the extreme difference in brightness between the sun and the Milky Way, this alignment is observable only in a computer simulation. The solstice will occur Thursday, Dec. 22, 2011. On this day, the sun is at its farthest southern declination, and is 6.5 degrees away from the center of the Milky Way. The moon will be just to the right of Mercury on Dec. 22 (shown here) and just to the left of Mercury on Dec. 23. On Thursday, Dec. 22, 2011, the moon will be just to the right of Mercury. Three of Jupiter’s moons will put on a fine show tonight. Callisto will be in an unusual position due south of the planet because of the extreme tilt of the plane of Jupiter's moons this year. Europa will be moving off from in front of Jupiter on one limb while its shadow begins a transit on the opposite limb. Ganymede, well off to the right, will still be casting its shadow just below Europa. Finally, the Great Red Spot will be perfectly placed right in the middle of all this. Three of Jupiter’s moons will be visible on Tuesday, Dec. 27, 2011. Mercury is well placed in the eastern sky before sunrise for the last half of the month. Venus is low in the evening sky after sunset all month. The waxing crescent moon will pass close to Venus on Monday, Dec. 26 and Tuesday, Dec. 27. 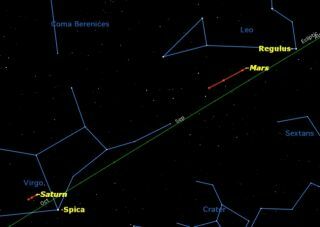 Mars spends all of December in the morning sky in Leo. It now outshines nearby star Regulus and grows from 7 arcseconds wide to 9 arcseconds during the month, large enough to reveal its polar cap and dark surface markings in a 6-inch (150-mm) telescope. It is now approaching magnitude 0, making it one of the brightest objects in the morning sky. Jupiter continues to be well placed in the evening sky all month on the border between the constellations Aries and Pisces. Jupiter and Venus are the brightest objects in the night sky other than the moon. Saturn is visible before dawn in the eastern sky. It now shines brighter than nearby star Spica. Neptune is well placed in the early evening in Aquarius all month.